Writing Creatively: What is talent? I received an email today that truly amazed me. I'm not usually wowed by emails, mostly because I've read the same ones over and over. Today, though, Mom sent me a new, never-seen-before email with a link to a video that got me thinking about creativity and talent and remembering how, when I was young, I would spend hours producing what I considered to be masterpieces worthy of publication (they later proved to be colossal embarrassments – like the mystery thriller I wrote when I was around ten that started, "Thousands upon thousands of burglars piled into the city..." – My mother still falls apart when we reminisce about that first line). Every school year, when my parents, sisters, and I roamed the aisles looking for crayons, pencils, pens, and paper, I breathed in the aroma of the new supplies and couldn't wait to get home and open them. I loved designing and I loved writing. I couldn't (and still can't) draw. Three dimensions on a two-dimensional plane have always mystified me. How do people penetrate the paper with their pencils to demonstrate the peaks and valleys of a face? I could never figure it out. As I forced my pencil into the page and discovered holes instead of shadows, I realized my talent was NOT going to be expressed in art. I gave up drawing and focused instead on designing and writing. 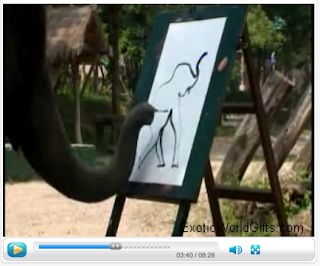 And then today I discover an elephant that has more ability to draw than I do. Sad. How is it possible for an elephant to draw a self-portrait? Makes me wonder. Maybe every living thing has a talent, and it's just a matter of being given an opportunity to express that talent. Who thought of putting a paint brush into an elephant's trunk? That elephant is one cool dude.